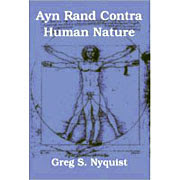 Neil's article refutes the view expounded in Rand's article "Objectivist Ethics." In that article, Rand attempted to refute the is-ought gap by claiming that Hume denies that morality has anything to do with facts. This is just wrong. In a later article, Rand pursued a different tactic. She suggested that ethics is conditional on choosing life. Now logically this does allow Rand to skirt around Hume's is-ought gap, because instead of reasoning from "is" premises to an "ought" conclusion, the line of reasoning goes, "if x, then y," or: "if life, then the ultimate value is life." While this mode of procedure may solve, or at least mitigate, the logical problem presented by the is-ought gap, it is questionable that it provides an "objective" code of values. The argument is so vague and abstract that it's difficult to logically generate a specific moral code that can guide everyday decisions. How does saying that life is the ultimate value help a person choose their career, or their life-mate, or how to spend their free time? Well, it doesn't help with any of these things. It's not even clear what it means, in terms of practical decision making. If life is the ultimate value, does that mean you should act to survive as long as possible? But that's not the principle Objectivists follow in their own decision making. Objectivists make use of the argument to "prove" the objectivity of their morality. Then they ignore the argument and follow their natural hard-wired and socially fine-tuned proclivities like everyone else. As a point of fact, human beings don't follow articulated moral systems derived from abstract philosophical reasoning. Everyday decision-making involves too much complexity for articulated systems of morality to work and be effective. Our brains have evolved complex motivational systems that help us survive and breed. These systems are hardly perfect and can perhaps be improved here or there through conscious reasoning (although that's not always the case), but it's impossible to entirely replace them with a "code of morality" based on a philosophical system of ethics like Objectivism. The Objectivist Ethics is little more than an ex post facto rationalization scheme to justify behavior Rand and her followers approve of and to provide a moral rationalization for the Objectivist politics. It doesn't provide a guide for how people should behave; it provides tools to rationalize types of behavior approved of by the broader Objectivist community. For info (and scientific evidence) on how morality works in the real world of fact, see James Q. Wilson's The Moral Sense, Jonathan Haidt's The Righteous Mind, and/or Jordan Peterson's YouTube lectures on "Personality" and "Maps of Meaning."